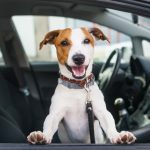 Find the latest reviews for the best dog fish, salmon and krill oil for dogs – newly updated for 2019. After study and review of the fish oil supplements, we have chosen the top 6 best fish oil for dogs. Reviews included looking at the best and most pure form of fish oil, including salmon oil for dogs. Other types of fish oil include krill oil for dogs. Fish oil provides Omega-3 fatty acids EPA and DHA, which helps your dogs hair and coat, as well as having other health benefits. 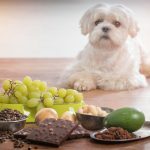 Below are our best and top 6 choices for fish oil for dogs with more detailed reviews and opinions presented below the table. We reviewed, classified and looked at the many fish oil supplements for dogs on the market today. Below is a more detailed review of fish oil products for dogs. Each bottle of Zesty Paws Pure Wild Alaskan Salmon Oil contains 32 fluid ounces of product. 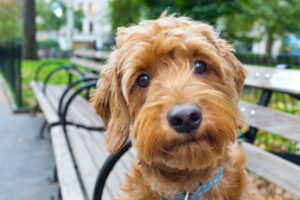 By having the product in a pump bottle, the seller claims it is easier to give the product to your dog by adding it to their food – as opposed to trying to feed a capsule to an uncooperative dog. We tend to agree. 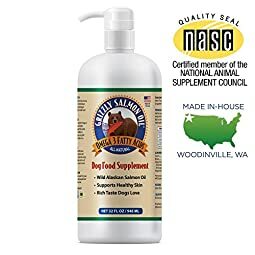 The Pure Wild Alaskan Salmon Oil supplement features all-natural ingredients and is made in FDA-registered facilities in the U.S.A. that follow good manufacturing practices (GMP). We give Zesty Paws Pure Wild Alaskan Salmon Oil a thumbs-up and our highest FIVE STAR ranking! 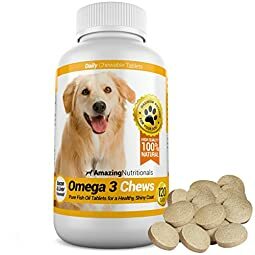 Each bottle of Amazing Nutritional’s Omega-3 Fish Oil contains 120 bacon flavored chewable tablets. These tablets are bacon flavored and contain 300 mg of Omega 3-6-9 Fish Oil (18% EPA, 12% DHA) 150 mg Sunflower Oil (Helianthus Annuus) and 51 mg Evening Primrose Oil 100 mg. Other included ingredients are calcium, microcrystalline cellulose, liver, whey, stearic acid, bacon flavor, magnesium stearate and silicon dioxide. The product is manufactured in the USA in a GMP and organic certified facility. The seller also offers a money-back guarantee. We give Amazing Nutritional’s Omega-3 Fish Oil our ranking of FOUR STARS. 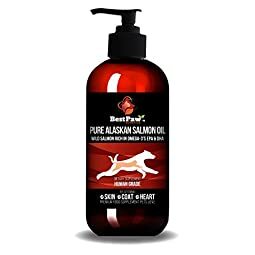 Each Pure Paw Premium Wild Alaskan Salmon Oil pump bottle contains 8 ounces of liquid product. The product is advertised as 100% wild-caught with only one ingredient, alaskan salmon oil and no additives or preservatives. Since the product has no additives for odor control, it does have a “fishy” smell – as it is pure fish oil. 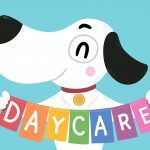 The product is made in the USA with a satisfaction guarantee. If you are searching for an honest to goodness fish oil product with nothing else added, this is your best choice. And because it is 100% fish oil for our furry friends, we give Pure Paw Premium Wild Alaskan Salmon Oil our best FIVE STAR star rating. The Grizzly Salmon Oil product comes in a 32 ounce pump bottle. The bottle states that the only ingredient is “Salmon Oil”. Fish oil contains Omega-3 fatty acids, DHA and EPA. 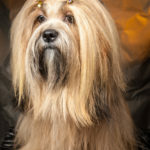 The seller and manufacturer state that the product will, “… improve skin and coat with less shedding, supports immune system, sustains natural joint and heart health, improves energy level in older dogs, and the fresh fish flavor enhances the foods taste.” The Grizzly company makes several other products for dogs as well. The Grizzly Salmon Oil product gets our THREE STAR rating. The Grizzly Pollock Oil Supplement for dogs container is a pump plastic container that holds 64 ounces of product. Unlike other fish oil products, this is NOT salmon oil, but Pollock oil. This fish oil is said to have less (or no) “fishy” smell or taste. Many dogs that may not like the smell or taste of salmon oil, may enjoy this product. This product has one of the highest Omega-3/6 ratios in natural fish oils, a ratio in the range of 13 to 14 which compares well to wild salmon oil and far higher than farmed salmon oil. So if you are searching for a dog fish oil that is pure oil with less of a fish smell and taste, this is your product. And for that reason, we the Grizzly Pollock Oil Supplement our highest FIVE STAR rating. Each bottle of Pet MD Omega-3 Fish Oil Supplements contain 180 soft-gels. One soft gel capsule contains 1000mg of fish oil (180mg EPA and 120mg DHA). The fish oil is cold water anchovy and sardine oils which contain Omega-3 fatty acids, as well as 180mg of EPA (eicosapentaenoic) and 120mg of DHA (docosahexaenoic). 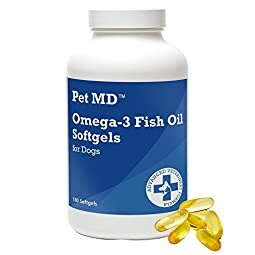 A good all-around fish oil product for your dog. We give Pet MD Omega 3 Fish Oil Supplements our FOUR STAR rating. It is important, for obvious reasons, to choose a fish oil supplement with the lowest fish odor and taste – since most manufacturers recommend piercing the fish oil capsule and/or adding the liquid to your dog’s moist dog food. Fish oil supplements can help a dogs coat and skin – just like it does their human friends! 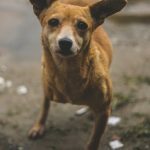 What is Fish Oil for Dogs? Just like in people, fish oil is essential for the health of a dog. There are different types of fish oils namely; Omega 3, 6 and 9. The most recommended one is Omega 3. It is perfect for reducing allergic reactions as well as inflammation. According to scientists, most dogs are likely to get cancer at one point in their life time. With Omega 3, a dog can live longer since it ensures that cancer does not grow or spread any further. It is important that extensive research is done before buying any fish oil to avoid being conned. Natural foods such as canned sardines and quality eggs can be a good starting point when searching for Omega 3. 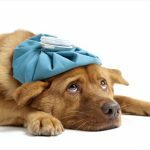 How Does Fish Oil Benefit Your Dog?